Tyre(s) are removed from the wheel(s) which are then chemically stripped of all their original paint and lacquer. Then the entire wheel is re-coated and re-lacquered, and cured in our high temperature industrial oven. The tyres are then re-fitted, pressurised to spec and digitally balanced to zero. Any kerb damage or corrosion is eradicated with hand tools and light grit blasting, deep damage will be aluminium Mig welded and crack detected. 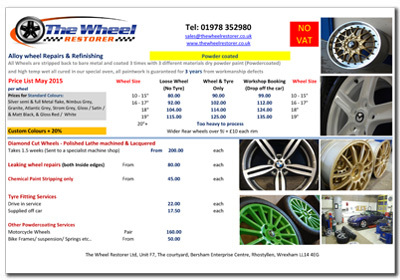 Prices are from per wheel. If you are paying by credit card a 1.75% surcharge is added.